I am Emanuele dello Strologo and I am a professional photographer based in Genova I am specialised in portraits, landscape and editorial Images. My work in syndicated by Getty Images. I am charismatic person and I love to share my passion for photography and visit the romantic landscapes of Italian Riviera, Cinque Terre . We will explore some of the villages of the Cinque Terre Monterosso al Mare, Vernazza, Corniglia, Manarola, and Riomaggiore. Through the paths we will arrive at strategic points to better admire the beautiful views. We will visit local crafts, and I will give you advice on typical Ligurian dishes and where to buy them. I will take also some photograph you and your fellow travellers along the walk. We will end our photographic walk in a suggestive panorama overlooking the sea. The Cinque Terre Photo Walk is available in the 3h - 5h and 6h a boat ride can be added. 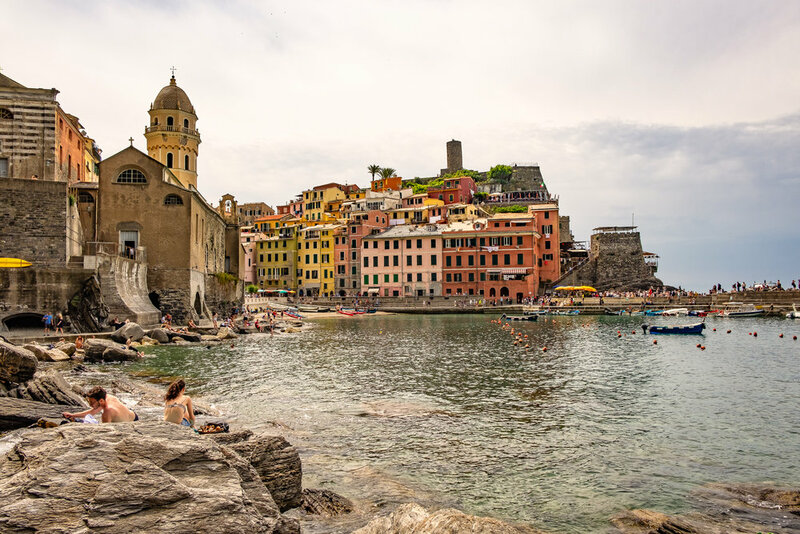 Cinque Terre are Monterosso al Mare, Vernazza, Corniglia, Manarola, and Riomaggiore. An exceptional experience along one of the prettiest coastline in Italy, There are a lot of out-of-date travel websites that still describe it as a dangerous horrible walk. Fortunately, things have changed. Replace the terrified pedestrians with walkers and joggers who now have the best views from a sidewalk or boardwalk running along the seaside of the road - suspended next to the road in the narrowest sections. Strolling couples, hikers with back packs, families with baby carriages share the walk, smiling and greeting each other as proper vacationers do. The view is to the south, the hills of the Italian Riviera meeting the bays and inlets of the Bay of Tigullio. The water is a constantly changing mosaic of blues that range from indigo to light aqua, with sunbathers below here and there on sand if available, on pebbles and rocks if not. In the shallows just below, you might see sport divers with enormous flippers searching for sea food. A 3 hours one-to-one photo walk discovering hidden and secluded parts of Cinque Terre, without forgetting the famous landmarks, while taking great shots and with a one-to-one tuition to improve your photography skills! The best way to discover a large part of Cinque Terre and its daily life. As the above 3h tour but 5 hours one-to-one Tuition to improve your photography, while taking great shots and discover hidden villages and corners of Cinque Terre! The tour is one-to-one so there will be just you, or your family/friends. It includes a coffee + croissants break The Tour can be tailor-made based on your interests and expectations, can be more Photography workshop vs less touristy Cinque Terre.